Public pension systems have gained national attention in recent years. The primary focus of the policy discussion to this point has been on the cost of these systems, and for good reason. State and local governments have accumulated more than a trillion dollars in unfunded liabilities for pensions owed to public workers for past service. And payments on that debt have resulted in great financial strain; annual contributions have grown two-and-a-half times larger since 2001, forcing difficult fiscal tradeoffs in many jurisdictions. The benefits side of the pension equation, meanwhile, has received relatively scant attention. Since 2005, 49 out of 50 states have changed retirement benefits for some of their workers, but the effect of these changes on workers has often taken a back seat to simple cost reduction. As governments across the nation have begun to alter their retirement systems, now is an ideal time to also consider whether pension benefits that were designed many decades ago should be modernized to better fit today's workforce. It is commonly believed that defined-benefit plans are good for public workers — the only problem is the high price tag. But these traditional retirement systems are often extremely backloaded, meaning that workers earn very meager retirement benefits early in their careers — indeed, usually for the first 20 years or so — and then rapidly earn much more valuable benefits as they approach their system's specified retirement age. As a consequence, many public workers simply do not have real retirement security for much of their careers. Workers who leave before retirement to take a public-sector job in another state or to take care of family are generally left with very little in retirement savings. This problem is especially true in teaching, where workers are generally more mobile both geographically and among sectors. According to our calculations, based on figures reported by the Institute for Educational Sciences, only about 28% of American public-school teachers remain in the profession for even 20 years. The overwhelming majority leave their positions well before reaching the retirement threshold of any public retirement system, and so they will leave teaching having earned very little, if any, retirement compensation for their time in the classroom. These systems do not provide adequate retirement security for teachers. Today's young workers are simply not likely to remain in the same job for four decades. A retirement system designed for such long-term stability is therefore poorly suited to their needs, and so is unlikely to attract the most qualified candidates to the profession or to reward teachers adequately for their work. As they consider reforms to teacher pensions, policymakers around the country should consider some superior alternatives that would increase the appeal of teacher pensions without increasing their cost. Nearly 90% of American public-school teachers participate in a final-average-salary defined-benefit retirement plan, which we will refer to here as FAS DB plans. In these systems, once a teacher is vested, he earns a lifetime annuity that can be accessed only after he reaches his plan's retirement threshold, which is generally determined using a combination of age and years of service. If a teacher leaves the system before reaching the plan's retirement threshold, he must defer receiving his annuity until he becomes eligible. A teacher's annual retirement payment is calculated as a percentage of his final average salary (usually the average across his last three to five years of employment) when he leaves the school system. The percentage of his final average salary he will be eligible to receive in retirement increases by a certain number of percentage points for each year he spends in the classroom (usually about two percentage points per year of service). Thus, the annuity a teacher earns increases as he accrues more years of service in the same system and as his salary increases. Because retirement benefits are paid in the form of annual payments for life, the value of a teacher's pension (the so-called "present value" of the annuity) depends on both the size of the annual payment and how many years that teacher lives after retirement. We can therefore calculate its value using conventional actuarial techniques. 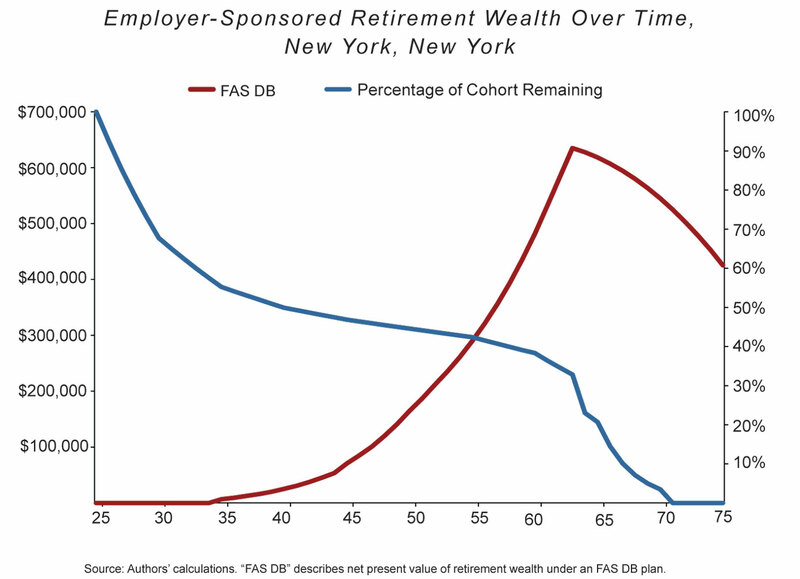 The figure below illustrates the present value of pension benefits that will be earned under New York City's pension plan by a newly hired 25-year-old teacher. (In order to focus exclusively on the benefit provided by the employer, the values in the figure exclude employee contributions.) The gray line in the figure represents the expectations of the pension plan's actuaries regarding what portion of the cohort of teachers in question will still be working in the district over time. 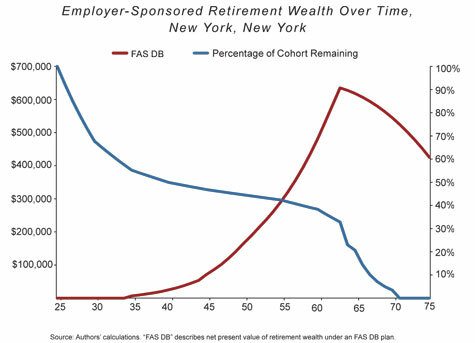 New York City's teachers earn retirement benefits in a pattern that is similar to those seen in many other FAS DB plans — teachers earn very little retirement compensation through the early and middle portions of their careers, followed by a period in which benefits accrue quickly, and finally, after reaching retirement eligibility, their benefits begin to lose value. A teacher who began working in the New York City public-school system at age 25 and left the system 38 years later would retire with an employer-funded lifetime annuity worth about $635,090 — an average of $16,713 per year of service. However, had that same teacher exited the system after 20 years of service — perhaps to take a teaching job in another state — New York City's contribution to his retirement would be a lifetime annuity worth only about $70,738, or an average of $3,537 per year of service. Put another way, our hypothetical New York City public-school teacher earns roughly $3,500 per year of work for the first 20 years of service and then $30,000 per year for each of the subsequent 18 years. FAS DB benefits exhibit this backloaded pattern for four reasons: The annuity they provide is based on final average salary; teachers who separate before retirement eligibility must defer receiving their annuity until eligible; final average salary is generally not indexed to inflation when a teacher must defer; and those who separate before retirement must usually wait longer to receive a benefit. Teachers' pension benefits actually lose value after they peak when a teacher becomes retirement eligible because, for each additional year that teacher spends in the classroom, he is losing a pension year, and the increase in the value of his annual benefit is not enough to offset the loss of a year of that benefit. Together these factors result in a benefit that accrues in a highly non-linear fashion across a teacher's career, a point that is poorly understood by the policymakers who manage benefit parameters. Its status as the nation's largest public-school district makes New York City an important example, but New York's plan is actually less backloaded than the plans offered to teachers in many other large districts. 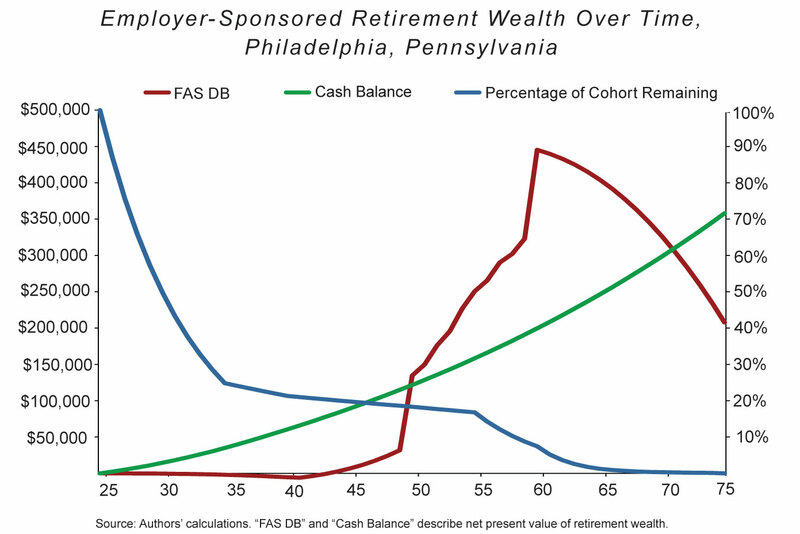 The chart below, for instance, provides a similar illustration of pension benefits under the retirement plan for Philadelphia's public-school teachers. This plan is much more backloaded than New York's. A teacher who starts in Philadelphia at age 25 won't earn meaningful retirement compensation until he is about 50 years old. But if he sticks around for a few more years, he suddenly becomes eligible for a much more generous pension package — earning nearly $325,000 in retirement compensation over the next ten years. Why should backloading matter to a new public-school teacher? After all, if he's not going to retire until he's 65, why would he be concerned about the value of his pension plan when he is 45? Simply put, the promise of a guaranteed lifetime annuity produces a false sense of security and leaves many teachers with the belief that they are saving enough to ensure a secure retirement when, in fact, they do not truly begin to accumulate valuable retirement benefits until late in their careers — well past the age when Americans should start saving. The defined-benefit design protects teachers from investment and longevity risk. But the backloaded nature of the benefit exposes teachers to the substantial risk that they will leave the system before earning anything close to a secure retirement. We refer to this as "attrition risk." In reality, these school systems know that the large majority of those who take a teaching job in a public school today will leave with little to no retirement compensation for their service to students. Early-career attrition and mobility is high for public-school teachers, especially those working in hard-to-staff, urban districts. Nationwide, only about 28% of those teachers who enter the classroom will remain in the profession for two decades. Even among those who do remain in teaching for their entire careers, many will move across state lines and thus exit out of their original pension plan — likely before they've begun to earn enough for a secure retirement. Since they need to accurately forecast the value of retirement promises made to teachers, the pension plans have developed their own estimates for teacher attrition based on historical patterns. These estimates demonstrate that pension plans expect only a minority of teachers to participate long enough to earn large retirement payouts. Even in New York City, where attrition is not as high as in other urban districts, the attrition estimates show that only about a third of those who begin teaching in the school district will be employed by the school system long enough to reach normal retirement and maximize their pension benefit. 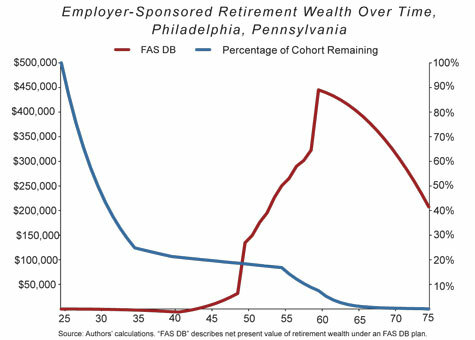 In Philadelphia, only 7% of those who begin teaching at age 25 are expected to work in the state of Pennsylvania long enough to maximize their pension benefit. According to a recent report by Bellwether Education Partners, more than half of new teachers will leave their school system having earned no retirement compensation at all because they will not work long enough to vest and become eligible for an annuity. This trend would not be overly problematic if vesting periods (the number of years required to become eligible) were short, but 17 states require teachers to work ten years or more before they are vested. And, in recent years, states have been increasing these vesting periods. Today's backloaded retirement benefits create many losers, but also a few big winners. It is this group of winners that produces the perception, common on the right, that taxpayers are providing public workers with over-generous, gold-plated pensions. But what is really going on is a simple but uneven distribution of wealth among the workers themselves: Those who do not work under a single system until retirement are subsidizing those who do. For a portion of most teachers' careers, the contributions to the pension system made by the district on their behalf are more valuable than the benefits they have earned. When teachers leave the system during this period, the contributions made on their behalf in excess of the value of their benefits are used by the pension plan to pay workers whose benefits exceed the employer contributions made on their behalf. In this way, FAS DB plans explicitly rely on shortchanging many employees to pay for the generous benefits offered to a select few. It is safe to assume that few enter teaching primarily for the money. Pay for public-school teachers is not as bad as many suspect (especially after taking into account the shorter work-year), but the average public-school teacher in the United States takes home significantly less money than does the average similarly trained professional in the private sector. It is often assumed that the generosity of teachers' retirement benefits more than makes up for the poor pay and is the public-school teacher's ultimate financial reward. To be sure, a teacher who works in the same school system for three to four decades will receive a generous retirement benefit. As noted earlier, a New York City teacher who began working at age 25 and retired at 63 would have earned retirement compensation worth about $635,090. That's the equivalent of an employer contribution rate of about 12.9% of pay. Teachers in New York City also participate in Social Security, adding another 6.2% of pay to annual retirement compensation, resulting in total deferred compensation of 19.1% of annual pay. In contrast, according to the Bureau of Labor Statistics, the average private-sector manager or professional earns only 11.6% of salary (including Social Security) in the form of retirement compensation. Such examples contribute to the belief that pension promises are a major drain on taxpayers. But that story is wrong, or at least fatally incomplete. In fact, according to our calculations for the plans operating in the ten largest school districts, as a percentage of compensation, overall taxpayer contributions to cover the cost of new retirement benefits earned in a given year are comparable to the norm for similar private-sector employees. How could that be? While it is true that total contributions are substantially larger today for public- versus private- sector workers, the majority of that cost is associated with unpaid bills from the past and not new benefits earned by teachers. And for those benefits being earned today, the large, headline-grabbing retirement package described above is counterbalanced by the very low retire-ment benefits earned by the large majority of teachers who leave the system before retirement eligibility. Today's backloaded pension systems are therefore not unfair to taxpayers, but they are unfair and highly inequitable for teachers. Taxpayers aren't paying the full cost of the substantial retirement benefits offered to those who retire "on time" under today's teacher pensions systems — it is often younger teachers, whose own retirements are being shortchanged, who are footing the bill. Very few teachers entering classrooms today will actually receive the gold-plated pension benefits often discussed in the press. Those who operate today's teacher-pension systems not only know this, they count on it to keep costs down. There are numerous ways that policymakers could reduce the backloading of retirement benefits and thereby create more equitable plans that provide greater retirement security to more workers. One particularly promising approach may be a cash-balance defined-benefit plan, which we will refer to as a CB plan. Under a CB plan, the value of teachers' retirement benefits is simply equal to annual contributions plus guaranteed earnings on those contributions, and benefits are paid in the form of a lifetime annuity. The CB design provides a clear and helpful contrast to the current backloaded plans, as teachers accrue retirement benefits more smoothly across their careers. We focus on this sort of plan in particular because it maintains the investment and longevity protection offered under current FAS DB plans. In our research, we have designed CB plans that are actuarially equivalent to the plans offered today in each of the ten largest school districts in the United States. Our alternative plans are therefore cost-neutral to taxpayers and do not represent an aggregate benefits cut for teachers. Of course, since significant pension reform does not happen often, policymakers might want to take the opportunity to suggest ways to shore up pension plans and reduce their cost — and those suggestions could certainly be part of such a reform effort. But our purpose here is to show how the problem of backloading can be corrected without affecting overall cost one way or another. Our plans simply smooth teachers' pensions by basing the benefit on a constant percentage of their earnings instead of a percentage of their final-average salary. As such, the plans more evenly distribute retirement benefits instead of disproportionately benefiting a small minority as the current system does. In order to create our CB plans, we estimated a constant employer-contribution rate that, when accumulated and grown at a guaranteed rate of 5% per year, would yield benefits that were cost-equivalent to the current plan in each district. In pension parlance, the employer-contribution rate for our CB plans is equal to the normal cost of benefits under the current FAS DB plans, calculated using the "entry age normal" method and a discount rate of 5%. The table below shows the calculated employer-contribution percentage for the plans currently offered by each of the ten largest school districts. To calculate the value of the CB benefit at each point in their careers, we multiply this constant rate by teachers' cumulative earnings. It is worth noting that there are significant differences in the generosity of retirement benefits across districts. Most school districts offer a meaningful benefit valued at roughly 10% of salary per year. 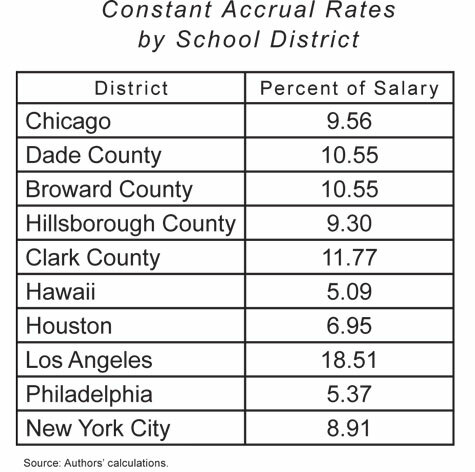 However, two school districts (Hawaii and Philadelphia) offer retirement compensation that on average amounts to slightly more than 5% of salary. Meanwhile, teachers in Los Angeles receive retirement compensation that is the equivalent of 18.51% of pay. 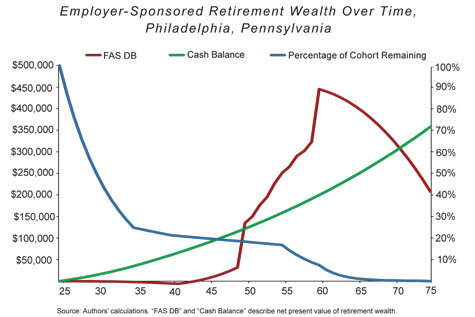 The chart below contrasts pension benefits under our alternative CB plan with the benefits in Philadelphia's current system. Unlike with the current FAS DB approach, teachers earn benefits at a relatively constant rate throughout their careers. As a result, teachers earn significantly more valuable benefits early in their careers under our alternative CB plan than they would under the existing plan; teachers who remain in the system for a long period of time earn less. If the expected value of employer contributions plus earnings under the current pension plan were to be charted, the line would look exactly like the CB line in the figure. The line clearly illustrates that for a number of years, employer contributions and interest are more valuable than the benefit a teacher has earned; later in a teacher's career, the opposite is true. The greater value later on is funded by contributions made by employers on behalf of teachers who leave the system earlier; the difference in the value of the cash-balance benefit relative to the current FAS DB at its maximum is driven by the rate at which younger teachers leave the system in the early and middle portions of their careers, when employer contributions are more valuable than their benefits. In other words, the FAS DB plan can only offer a more valuable benefit late in a teacher's career to the extent that other teachers leave the system earlier in their careers. The potential benefit of the less backloaded CB plan is particularly apparent when we consider expected teacher attrition. In New York City, for instance, by the time benefits under these two different approaches are equal (which occurs when our hypothetical teacher turns 56 years old) only about 42% of teachers who started with this cohort are expected to still be employed by the district. That is, 58% of teachers are expected to leave before they would benefit from the backloaded structure of the current plan. The situation is far worse in a district like Philadelphia that has high early-career turnover. Teachers who would remain in that system until age 50 would benefit from the existing plan. But only about 18% of teachers who enter at age 25 are expected to remain employed in the Philadelphia system that long. Relative to the current FAS DB approach, CB plans would provide higher benefits to teachers who leave their jobs for any reason earlier in their careers — at the expense of lower benefits for teachers who work under a single plan until reaching retirement eligibility. If a teacher were to know at the beginning of his career the exact number of years he would work under a single retirement plan, his preference between the systems would be obvious. Alas, like other young professionals, there is little reason to believe that new teachers are able to reliably forecast their tenure under a single retirement system. It is worth asking, therefore, which of the two plans a new teacher should prefer if he is acting rationally, given that he cannot know what his professional future may hold. The answer isn't obvious just from looking at the figures. The alternative CB plan would ensure that the teacher receives meaningful retirement compensation for each year of service, even if he leaves before his plan's retirement-eligibility thresholds. But perhaps this teacher would prefer the existing plans, in which he risks potentially receiving very little retirement compensation, for the opportunity to reach very large payouts if he manages to stay in the same system for the entirety of his career. We can use standard economic techniques to evaluate the preferences between the two plans of rational teachers just entering the work force. In economic terms, we can consider this as a question of "choice under uncertainty." To consider the choice of the average new teacher who is just starting out and does not have any particular knowledge about how long he will work under the same retirement plan, we need to assume that our entering teacher's probability of exit matches the historical pattern of teacher attrition within that particular pension system. Thus, each retirement plan yields a series of discrete and predictable payoffs across years of service that a new teacher can expect to achieve with some probability. Because our exit probabilities are tethered to the plans' expected attrition rates, this analysis should offer the best estimate for an average new teacher. In our model, teachers consider their expected retirement compensation when they take a job in a school district. When offered a choice between two plans, a risk-neutral teacher would prefer the one offering the highest expected value at the point of entry. By design, the alternative CB plans proposed here have the same expected value as the current system to which they are directly compared, respectively. Thus, a risk-neutral teacher should be indifferent between the plans. Empirical research, however, suggests that workers are at least somewhat risk-averse. That is, when exposed to uncertainty, individuals would prefer to reduce the difference between the final payoffs they might receive and thus will prefer a choice among options with a narrower range of payoffs even if the maximum payoff is lower than it might otherwise be. In addition, at least one significant laboratory experiment has found that teachers are particularly risk-averse. As such, we can meaningfully expand upon our analysis by considering teacher preferences under various assumptions accounting for their aversion to risk. In our hypothetical example, we are essentially offering the incoming teacher a choice between two lotteries. He can choose the possibility of a high payoff at the risk of very low benefits if he leaves before retirement eligibility, or he can choose a consistently growing retirement benefit for each year of service but a lower benefit if he ends up working in the same system until retirement. A rationally acting teacher who is at all risk-averse will prefer the less backloaded CB plan to the current FAS DB plan. In short, when offered a choice between two payout distributions with the same expected value, a risk-averse teacher will prefer the distribution with smaller variance: The CB plan offers the same expected return but less difference between potential benefit payouts. But how large is this preference? This is an essential factor to consider, if only because altering the structure of public pension systems is a difficult logistical and political undertaking, and it therefore might be worthwhile (from a policymaker's perspective) only if teachers' preference for the CB is substantial. In order to consider this, we can make some empirically grounded assumptions about how teachers value wealth and risk, and then convert these calculations into the "certainty equivalents" for each lottery and level of risk aversion. The certainty equivalent is a conventional economic calculation representing the dollar amount a rational teacher would be willing to accept in lieu of participating in a particular lottery (in this case, a retirement plan). A risk-neutral teacher would be willing to accept the pension plan's expected value (i.e., the payoffs weighted by exit probabilities at each point) in lieu of participating in the plan. If we assume our example teacher is more risk-averse, he would be willing to accept a smaller up-front payment in order to hedge against the possibility of exiting with a very small pension benefit. For example, think of a lottery based on a single coin flip. If the coin comes up heads, you receive $20; if it's tails, you get $0. The expected value of this lottery — the amount you would receive from the average coin flip if we played this lottery, say, a thousand times — is equal to the sum of its potential payoffs weighted by the probability you receive each of them, or $10. Standard economics shows that if you are risk-neutral you should be willing to accept the lottery's expected value upfront (that is, before the coin is flipped) instead of participating in the lottery; you would take $10 up front over the chance for $20 later. If offered any less than that, a risk-neutral person would take his chances with the coin flip. But what if you are risk-averse? In this case, you are disproportionately worried that the coin will come up tails and you will end up with nothing, and so you will take an opportunity to hedge against that chance. Depending on just how risk-averse you are, you might be willing to accept $7 up front in order to avoid flipping the coin. But would you be willing to accept $5? How about $2? If we know how you value money and how risk-averse you are, we can calculate the up-front payment (the certainty equivalent) you would be willing to accept in lieu of flipping the coin. We can do a similar calculation for new teachers looking at their potential payouts under different pension plans. A teacher entering a school system at age 25 has a particular probability (estimated by the pension system and therefore known to us) of exiting that system after a particular number of years in the classroom. We also know the value of his pension benefit at each point in time. Thus, once we make some empirically grounded assumptions about how he values wealth and risk, we can calculate how much he should be willing to accept, if acting rationally, at the time of hire in order to avoid participating in the pension plan. The average teacher would prefer the plan that produces a higher certainty equivalent at a given level of risk aversion. Because the plans, by design, have the same expected value, the plans have the same certainty equivalent for a risk-neutral teacher. As the assumed level of risk aversion increases, so too does the difference between the certainty equivalents for the plans. As an example, consider again hypothetical teachers in New York City. Under both plans, new teachers can expect to earn average retirement compensation equal to $98,380. A rational new teacher, ignorant about his prospective tenure, should be indifferent between accepting $98,380 when he is hired and participating in either of the retirement plans. A risk-averse teacher, on the other hand, would be willing to accept fewer dollars up front, in lieu of participating in the pension plans, because he is more concerned about the risk that he might leave the system having earned less than the expected amount. A new 25-year-old teacher in New York City who exhibits very modest risk aversion (say, a risk-aversion coefficient of 0.3, which is low given that empirical research suggests that, for the average American worker, the coefficient of risk aversion is about 0.7) would be indifferent between accepting an up-front payment of $72,874, and participating in the current FAS DB retirement plan. In comparison, we calculate that the same teacher would require an up-front payment of $87,077 in lieu of participating in the alternative CB plan. Thus, because he would require a higher up-front payment to forgo participating in the CB plan, this risk-averse teacher would prefer the CB plan over the one currently in place. Such teachers would prefer the CB plan because it offers a larger benefit earlier in their careers, thereby reducing the penalty they face for exiting the system prior to retirement eligibility. So the CB plan would be more appealing to teachers at every level of risk aversion, and grows more appealing as a teacher's risk aversion increases. Of course, this math would look different in different school systems. The magnitude of the preference between a given current system and its CB counterpart differs substantially and depends on the severity of the backloading of the school system's current retirement plan and the probability of remaining employed under the same plan for a prolonged period of time. 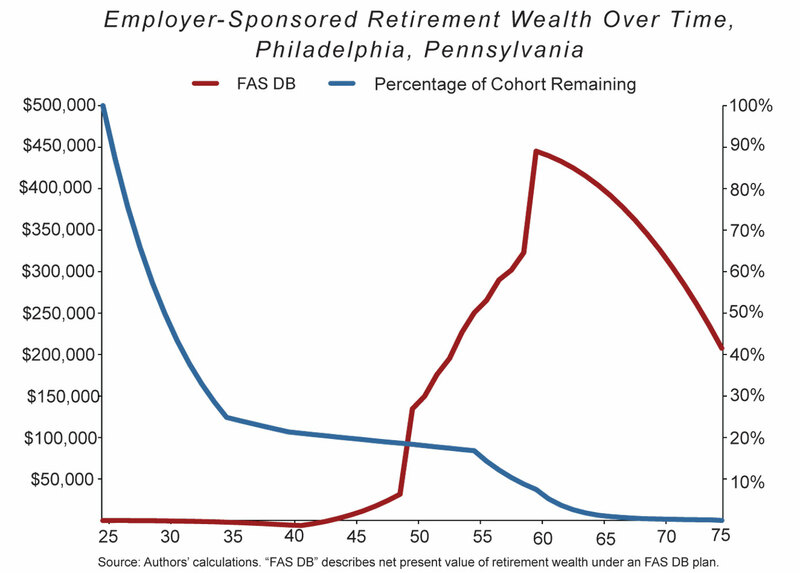 For instance, in Philadelphia, where there is high early-career attrition, even at a very conservative assumption of risk aversion (like our assumption of 0.3), the payoff a new teacher would require to forgo participating in the CB would be 70.7% higher than the one he would demand to forgo participating in the current FAS DB plan. 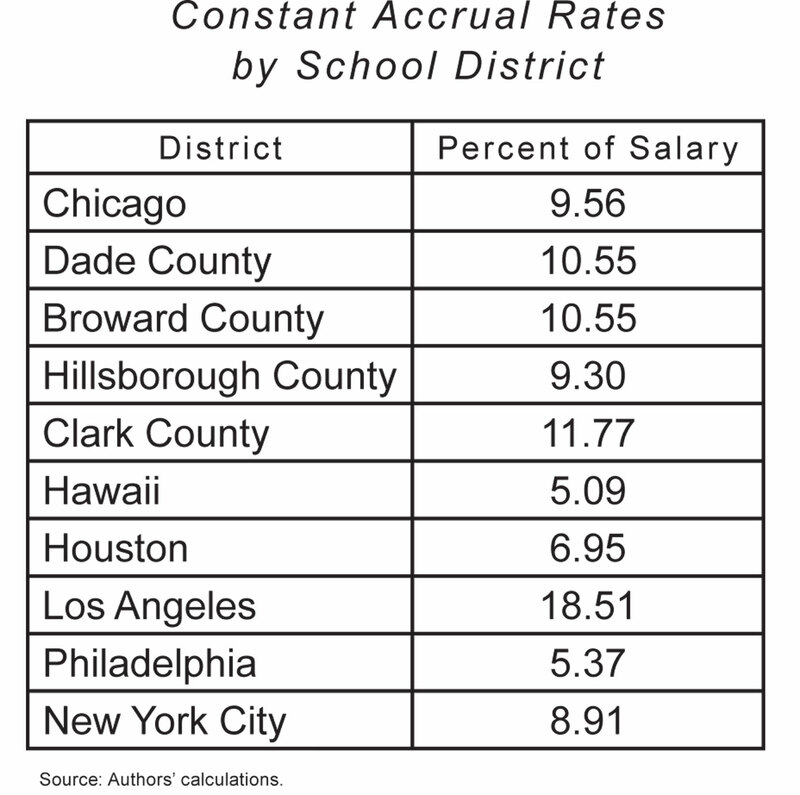 By contrast, even at a risk-aversion coefficient of 0.7, the payoff required for a teacher to choose not to participate in the CB plan in Chicago is only about 15.6% higher than the payment that teacher would require to not participate in Chicago's relatively less backloaded current system. Along with allowing for direct comparisons between plans, the certainty-equivalent calculations illustrate just how undesirable current pension plans are from a new teacher's perspective. In districts where benefits are heavily backloaded and there is significant early-career turnover, certainty equivalents for the current system can appear so low once risk aversion is introduced that they become downright implausible. In Hawaii, for instance, the certainty equivalent for an individual with an average level of risk aversion (a coefficient of 0.7) is only $279. In other words, a new teacher should be willing to accept $279 rather than participate in the system's current pension plan. But when one considers that 77% of Hawaii's entering teachers are expected to leave the system before earning even $279 in retirement compensation, this finding no longer seems so odd. This kind of calculation would of course look different for a teacher who was relatively certain he would stay in his current school system for an extended period. Such a teacher would prefer the current system, but only if he were confident he would remain there for quite a while. For instance, in the ten largest American school districts, we find that teachers who are certain they will remain in the same school system for at least five years would continue to prefer the CB plan over the respective current plan. In six of the ten districts, even teachers who are certain at the time they are hired that they will remain for ten years would continue to prefer the CB plan. These results are particularly revealing given the extreme nature of the test under consideration: Few if any individuals at the time they're hired can realistically say, with absolute certainty, that they'll remain employed under the same retirement plan for the ensuing ten years. Our results suggest that even if such an individual did exist, under a conventional assumption for risk aversion he would prefer the CB plan to current backloaded FAS DB plans in the majority of the ten largest school districts. Though it is not appreciated by the public or (we are led by our experience to believe) by public-school teachers themselves, those who operate today's teacher-pension systems are well aware of the implications of the backloaded character of those systems. And when pressed, those in favor of the status quo most often argue that backloading is necessary in order to retain experienced teachers. Economists Robert Costrell and Michael Podgursky have referred to this as the "golden handcuffs" argument: After a teacher has been in the classroom long enough that he is approaching the steep accrual rate on the pension curve, he would be crazy to leave because he would be leaving a great deal of money on the table. Thus, the current system creates a strong incentive for experienced teachers to stay. But there are at least two major problems with this justification. First, and this should not be overlooked, is the moral problem of using teachers' primary, and potentially only, pension plan as a retention program. Essentially, this involves holding teachers hostage in the classroom by threatening them with an insecure retirement if they were to leave. Teachers don't deserve such treatment. They should be justly compensated for their work each year. And their primary retirement plans should place all teachers on the path to retirement security, regardless of tenure or when they were hired. Second, there is no particular reason to believe that students benefit from such extreme measures being used to retain experienced teachers. A wide body of empirical research finds that novice teachers are, on average, much less effective than their more experienced colleagues. However, this research also demonstrates that the returns to experience on teacher quality plateau after about three to five years in the classroom. Thus, there is no particular reason to believe that a given 30-year veteran teacher is going to be better than a 20-year veteran teacher, who would be better than a 10-year veteran teacher. A pension system designed to retain teachers all the way until retirement age is not likely to improve teacher quality overall. The backloaded retirement system is a blunt policy instrument that encourages all teachers, whether they are great or terrible in the classroom, to stick around until retirement eligibility. And once they become retirement eligible, the system incentivizes all teachers to leave, again regardless of their effectiveness in the classroom. There is no particular reason to believe, then, that the backloaded nature of the current retirement system is in fact helping retain the teachers we want to retain. The common perception — both among teachers and among Americans in general — is that public-school teachers receive gold-plated retirement benefits that make up for their relatively low annual salaries. But that common story is misleading at both ends. Teachers are not systematically underpaid, and they are actually done a disservice by their pension plans. The vast majority of teachers entering public schools today will leave their jobs having earned little to no retirement compensation for the time they spent educating America's kids. Those who work a full career under a single retirement system will earn generous benefits, but those benefits come at the expense of other teachers who do not work for three decades under the same plan. With public-pension reform on the agenda in many states and cities these days, policymakers should consider not only the cost of pension plans but also whether current plans should be modernized to better fit a 21st-century workforce. Today's backloaded pension plans simply do not work for the vast majority of teachers. It is time for policymakers to consider pension structures that put all teachers on the path to retirement security. And such changes can be made while also maintaining important investment and longevity protections for those teachers. The CB plan design described here would be far better suited to today's young, mobile teaching professionals and would ensure that all teachers earn meaningful retirement compensation for each year they spend in the classroom. Josh McGee is vice president of public accountability at the Laura and John Arnold Foundation. He contributed to this essay as an independent scholar and not in his official capacity. Marcus A. Winters is an assistant professor in the college of education at the University of Colorado Colorado Springs and a senior fellow at the Manhattan Institute.